Stallion 3D uses an automatic Cartesian grid to provide the best accuracy and computational efficiency when compared to the topology of other grids. The grid is automatically generation and the process is invisible to the user during the workflow. Stallion 3D offers users the option to create simulation sizes ranging form quick (about 60,000 cells) to detailed (about 2,00,000 cells). 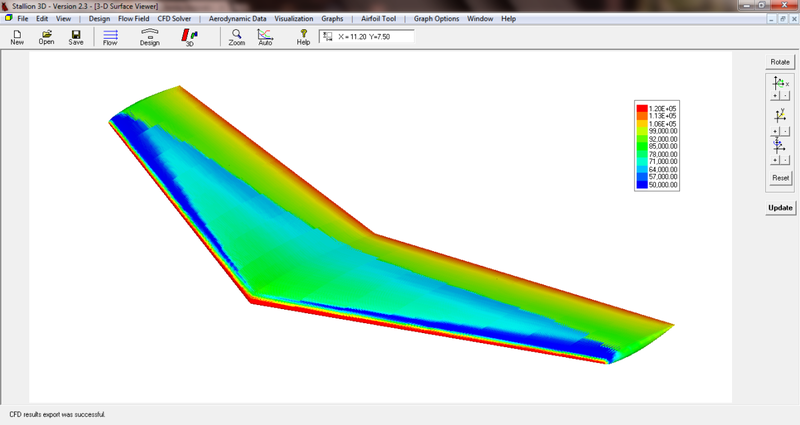 The Quick run allows users to preview how well a geometry performs before committing to a larger flow model size. The results below were obtain from two different simulation sizes. The first one is about 440,000 cells and is referred to as the coarse grid in the graphs. 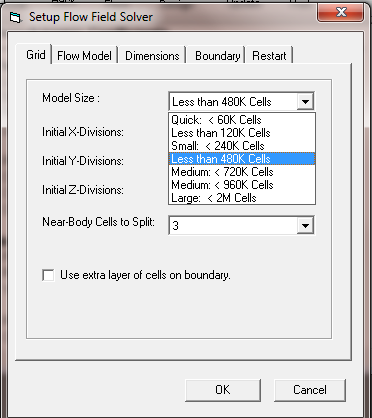 The second model is about 1,600,000 cells and is referred to the fine grid. A drop down box allows user to select the size of the simulation. 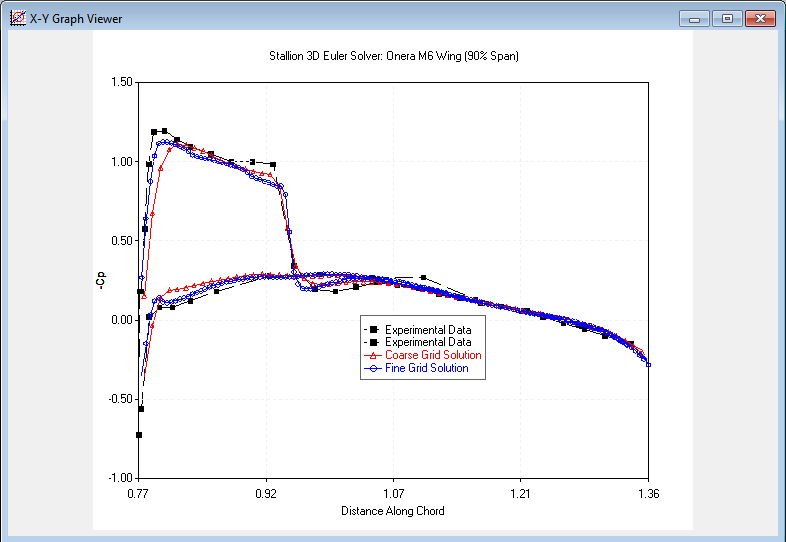 Stallion 3D accepts 3D solid models in the .stl format. 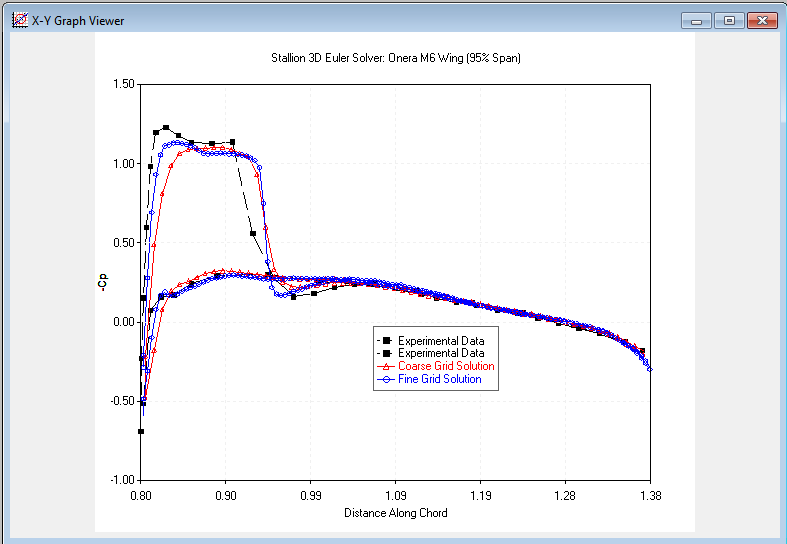 The stl file reader allows users to scale, rotate and position the model in the flow field. The stl file of the Onera M6 wing for this example is obtained from NASA OpenVSP. 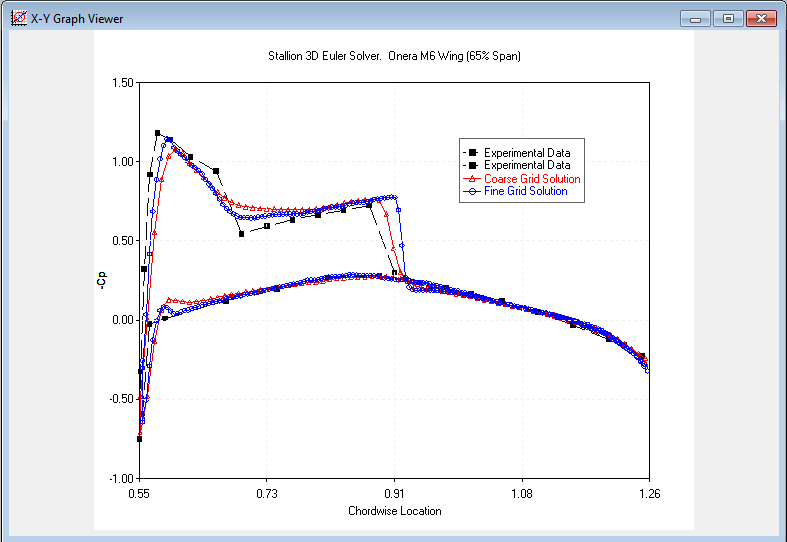 The simulation parameters are setup with the well know case of M=0.84 and an angle of attack of 3.06 degrees. 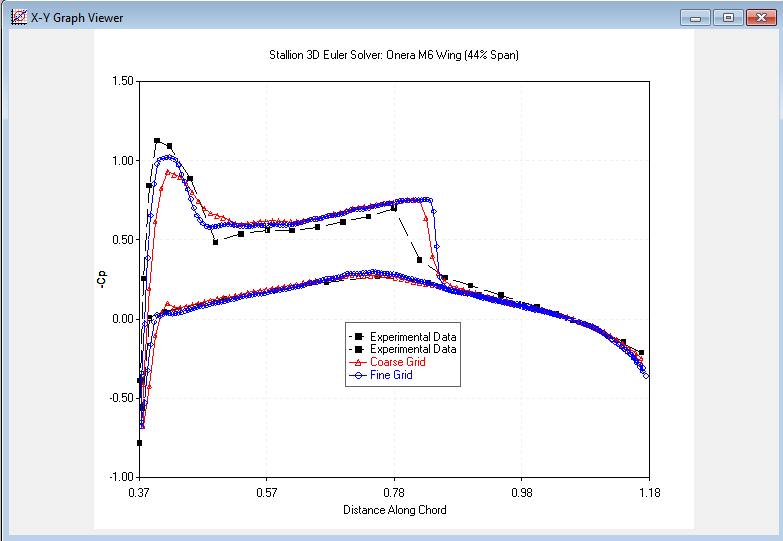 The result below shows the pressure on the surface of the wing for the fine grid case. Cp at the 20% span location. Cp at the 44% span location. Cp at the 65% span location. Cp at the 90% span location. Cp at th 95% span location. 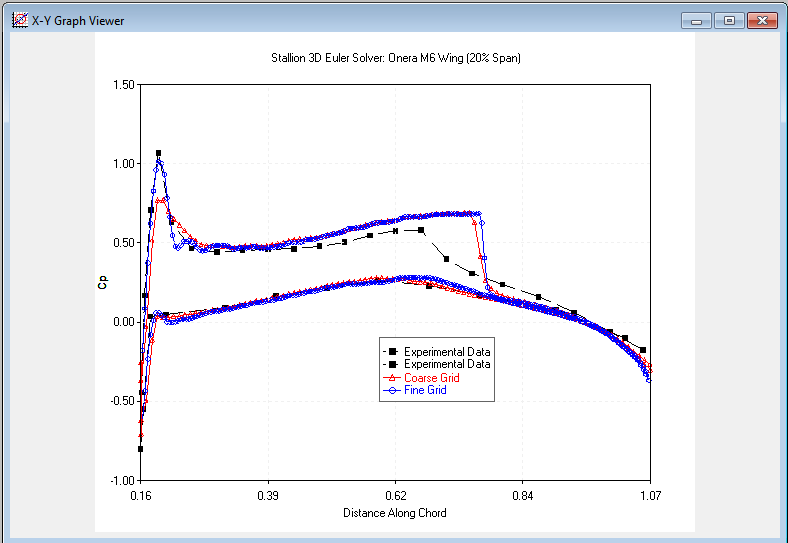 Stallion 3D compute forces and coefficients by integrating the pressure at the surface. This often provides good results for the lift and pressure drag. Caution must be taken when using this option if the model consists of a small number of facets or the geometry has a significant number of inwardly facing facets normal. Results Table for Faceted Surface Force Integration. Another option for finding the forces (especially when the geometry is questionable) is to use the Cartesian front option. This is a boundary consisting of the outward faces of the Cartesian cells closest to the geometry. To find the forces, the momentum equation is evaluated on the cell faces (Cartesian Front). This method provides good results for fine grids. In any case, the results for both methods of force integration should agree with each other. Do not hesitate to email or telephone us at (352) 240-3658 if you have any questions.